18-Mar-2011 -- We had tried to visit this confluence point already five years ago, on 12th of August 2006. At that time we tried to visit during the rainy season, but after we were 8km onto the dirt road in Xebannouane a massive flooding did not allow us to continue further and we had to turn around. We were still more than 50km away (as the crow flies), so no point in logging an unsuccessful visit. We had not given up on visiting this confluence and luckily nobody tried this point in five years! So this second time we made sure that we come in the dry season. We took the train from Bangkok to Ubon Ratchathani. It was an unusual cold day in Thailand, only 18 degrees in the evening, and as the air condition in the train was still running at maximum power we spent the coldest night since we live in Asia in this sleeper. We arrived the next morning at 7:20 in Ubon Ratchathani and took a taxi to the Thai-Laos border at Chong Mek. After the border in Laos we rented another car to take us up North. The distance from the border is 170km on paved road #13 to Xebannouane where we left the paved road onto the same dirt road like five years ago. This time, we could travel 65km on the dirt road to the East to come close to 16°N 106°E. We asked the driver to stop the car close to a small village. From there it was a 40 minute walk through forest, along a dry river bed and fields to arrive at the confluence point. 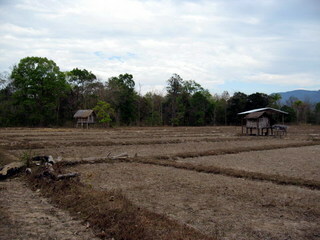 The point lies at the rim of the forest in a rice field on 299m elevation. There is not much around it than hills, rice fields and some rural hamlets. The villagers (shown on one picture) were eyeing us carefully, they did not seem to have seen many foreigners with GPS in that area.